Samson Stomp & Romp Participants! Thank you to all of the participants (runners, walkers and cheering fans) of the 2015 Samson Stomp & Romp! We welcomed a total of 2,153 participants overall, and a record number of children this year, a total of 90! The weather was partly sunny, and temps reach 37 degrees -- also another record! Thanks again to all who joined us in support of the animals -- we appreciate your participation, and look forward to seeing you in 2016! 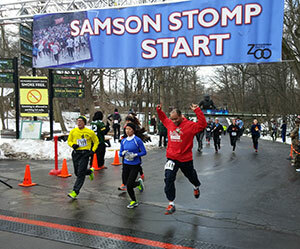 Mark your calendars now for the 36th annual Samson Stomp & Romp, January 17.